If you have wondered how to really reduce the chemicals in your home, or you’re looking for some work-life balance or a job that is meaningful to you – this may be the answer!! Do you want a FUN job with FLEXIBLE hours, and great work/life BALANCE? 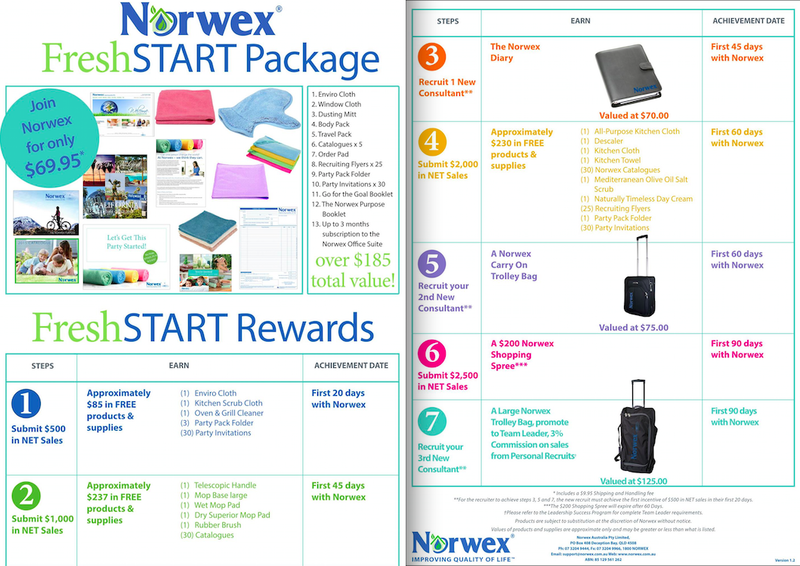 Would you like to get your hands on Norwex products for FREE or at WHOLESALE prices? Would you like to help people to SAVE MONEY, TIME, their HEALTH and the ENVIRONMENT? How about FREEING yourself and your family from chemicals and teaching others to do the same? Would you like to MAKE some extra money, or SAVE money for your family or even build a full time BUSINESS? Would you like FREE holidays, jewellery, gifts, supplies and of course, more Norwex products? What about the option to PROMOTE to leader when you want to, on your time frame? If the answer to any one of those is YES, Norwex may be the answer you have been looking for. And this month you can try it for FREE, paying only the $9.95 shipping fee for your whole start-up kit! 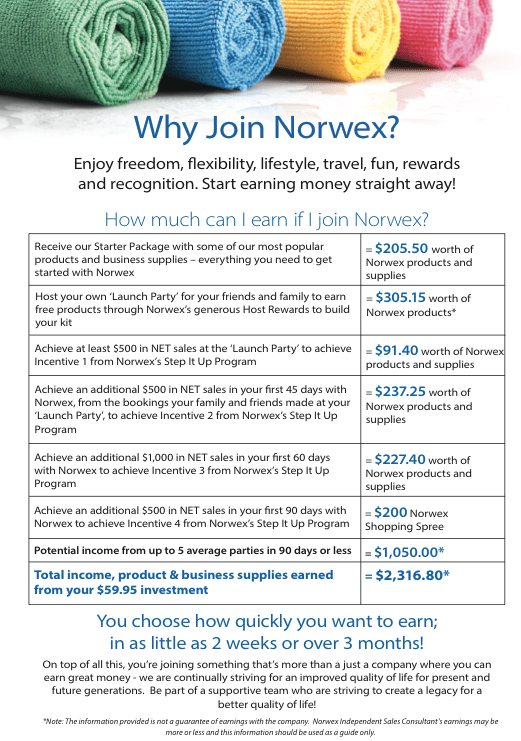 [EDITED – some of the detail in this post is out of date – for up to date prices, joining kits etc see How to Join Norwex in Australia or Join Norwex in New Zealand – Risk Free! or contact me for more info ~Kirsten). What do you get? A free envirocloth, a free window cloth, a free dusting mitt, a free body pack (3 cloths) and a free travel pack (4 mini-envirocloths), as well as catalogues, guides and so on. Not to mention access to HEAPS of training, both online and off! What other bonuses can you get? 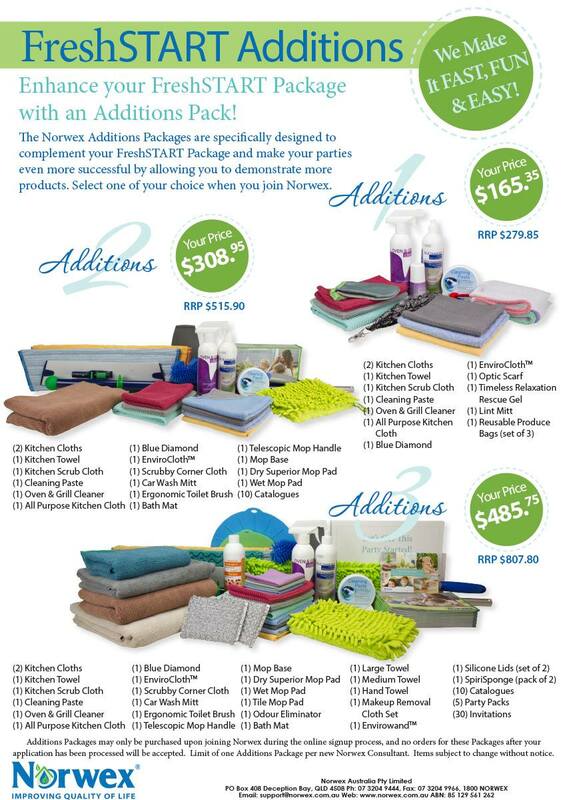 When you sign-up with Norwex there is the option to order one of their “additions” packs, which are awesome value themselves at about 40% off! You can only get these when you sign up, so have a think about what you would like to add? I will post the flyer with options below. Of course, this is on top of the Fresh Start REWARDS, which you can earn in the first 90 days after joining. You can earn literally THOUSANDS of dollars in commission and new products in those first three months, and it’s really so DOABLE. Have a look at the steps below and see what YOU could do. Just send me an email at kirsten@sustainablesuburbia.net, or give me a call on 0402 445 578, or contact me here with your questions, or simply sign up at http://kirstenmcculloch.norwexbiz.com.au. SAVE the $60 when you Join for Free in March!! The Fresh Start Package is open to anyone, whether you want to join to MAKE money or to SAVE money. No matter what your level of involvement, you are able to sign up and then follow any or all of the steps to earn more free rewards. There is also HEAPS of training available both online and off, both from me, from my upline leaders and from Norwex head office itself. You have access to training via webinars, email, skype, phone calls, facebook, and (depending where you are) in person meetings. You can be anywhere in Australia, or now New Zealand, and we can make it work for you! Just send your questions to kirsten@sustainablesuburbia.net, or give me a call on 0402 445 578, or contact me here, or simply sign up at http://kirstenmcculloch.norwexbiz.com.au. I would love to hear your questions, comments, or just that you want to sign up now! As I have said before, Norwex is the most amazingly generous company, and really set on making a difference in the world. The more I work with them, the more I come to respect them. And I’d LOVE to have you join my Norwex team and help us change the world one home at a time. One last thing before I go – I want to reflect the core values of Norwex which are Integrity, Trust, and Respect, and say – if you have been talking with another consultant about joining Norwex, then please go tell them you are interested. You will then join their team and make their day! ← Norwex is going to New Zealand!! I have a couple of friends who have joined Norwex so I think my circle is pretty much all Norwexed out at the moment. That said, I do love the cloth I won in a competition last year (it might have been on this blog? I can’t remember)! I’m not a party plan person at all. I admire people who are, because it’s so far out of my comfort zone! Love the pretty colours of the cloths though. Hello! I understand this actually is kind of away subject nevertheless, Id thought Id demand. Can you want to consider swapping hyperlinks or possibly visitor writing the weblog post as well as vice-versa? My personal web site covers many of the exact same subjects because your own as well as In my opinion we are able to significantly exploit one another. If you’re fascinated sense liberated to take me personally a good e-mail. We anticipate listening to via a person! Outstanding weblog incidentally!